House Democrats are in a bind on the focal point of their energy plan. Worried that a floor vote on any energy-related measure would trigger a Republican-forced vote on domestic drilling, the leadership has scrubbed the floor schedule of the energy legislation that it vowed to tackle after the Fourth of July recess. No it is not that the energy bill is out of gas, rather it is that Mrs. Pelosi is out of ideas. Lead, follow, or get out of the way. 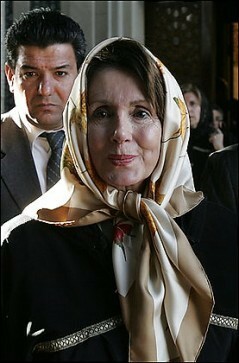 Mrs. Pelosi you have become the problem. Oh Mrs. Pelosi may have a clue, but it it is not how to represent the interests of the American people.